Connect the Ewent EW1085 USB Bluetooth Receiver to the USB port on your computer and connect to other Bluetooth devices such as a Bluetooth print server, headset or mobile phone. Especially your mobile phone is an essential tool. You engage in conversation, keep track of appointments and manage your contacts. Wouldn't it be great to synchronise all this data with the data on your computer at the push of a button? Now you can! 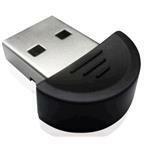 With the USB Bluetooth Receiver your computer wirelessly receives photos and data from your mobile phone. Moreover, data on your computer can wirelessly be sent to your mobile phone. The user-friendly and versatile interface of the Ewent EW1085 USB Bluetooth Receiver makes mobile management a piece of cake! Do you have a Bluetooth headset? You wirelessly connect it to the EW1085 USB Bluetooth Receiver and call via the Internet! The Ewent USB Bluetooth Receiver allows you to optimally use all your Bluetooth devices.